I know what you’re thinking. This has to be a parody of the Lonely Planet’s article released yesterday called “10 ways not to be a New Yorker.” And let me tell you: you’re right! I am here to help. You don’t want to spend your days in Barcelona and feel like the strangest of all beings, particularly if you aren’t given any advice. 1. 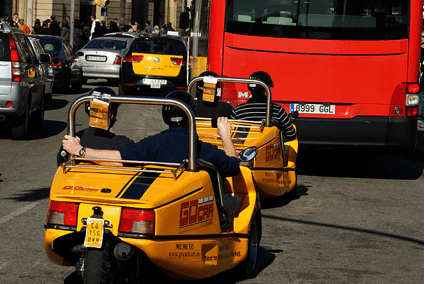 Take a ride on a tourist bus: Probably one of the most boring things to do in Barcelona. You’ll see all the monuments of the city, all of them, but you’ll see your life passing by, too while riding that bus. 2. Eat on the Rambles/Ramblas (and much less order a paella from Paellador). If you pay a little attention walking down the Rambles, you’ll realize only tourists are sitting at any of their terraces. Two reasons why: It’s expensive and the quality of the food is not as good as in any other bar. 3. Go to Pacha disco. This disco might sound familiar to you because of Ibiza, and it is in Barcelona too, but there are thousands of other cooler places to go in this city. Small clubs, live music, indie-pop temples, pilgrim places for all the hipsters. 4. Rent one of those cars at knee level to tour the city. For God’s sake, do you love your life? Have you realized the distance there is from the driver’s head to a bus road? I can’t suffer more when I see someone on that. 5. Spend 5 five hours at any of the Barcelona beaches. The fact that Barcelona has beaches is great, but unfortunately, they are not like in Cancun. I mean locals go in the summer, but I know foreigners who, say in November, see the sun and run like crowds of turtles (but much faster) to the sea. Meanwhile, we’ll probably be in a bar in Gracia or in the Born. 6. Falling asleep in the Ciutadella Park. It’s curious, tourists tend to love this. It’s nearly automatic: Finding a spot on some grass and falling asleep. Sorry, guys, but you are setting yourself up for a secure robbery of your wallet. Sometimes even an extra brown and smelly spot on your trousers. 8. Sitting at Plaça Catalunya. Yes, like New Yorkers do in Times Square but here locals even stay shorter in Plaça Catalunya, don’t know… it’s kind of uncomfortable, we prefer to walk on the pavement on the sides. And, for sure, sitting there, unless, for 15M reasons, it’s inconceivable. 9. Drinking liters of sangria. Seriously, have you tasted the Spanish wine? Why would you prefer sangria? Oh, wait, to get drunk more easily? Anyway, sangria is good (not at the Rambles, though) but, when you see a person drinking a liter-jar of sangria you know it’s a tourist. 10. Feeding pigeons. Of all the above-mentioned things a tourist wouldn’t do, I’ve left this one for the end as this is most likely the last one a local would do. This is because there are so many pigeons here, you can hear them almost from any spot and, let’s be sincere, they are not the cutest animals in the world… so tourists: Don’t feed our pigeons, they do sort it out pretty well. How about you? Do you have a suggestion for what NOT to do in Barcelona?